Staff on hand to encourage climbers throughout the session, but why not join in and climb with them for the extra encouragement?! Parents and guardians climb for only £5.50 - It’s important that a parent or guardian is present with the child at all times. Climbing is a great full-body workout, working on both strength and cardio. It targets your shoulders, back, biceps and triceps, your legs, and your core. If you’ve climbed before you will know that, the day after a good session, you will often feel soreness all over your body, showing you the muscles that had worked. At Clip ‘n Climb Chelsea we pride ourselves on promoting and delivering an activity for a healthy, active lifestyle. The use of our auto belays and attractive climbing walls make it a fun and easy way for both young people and adults to stay active in a fun environment, very different to your traditional climbing centres. Why not add a Climbercise class into your weekly fitness routine, allowing you to incorporate climbing with functional high intensity exercises, to help you on your health journey!! 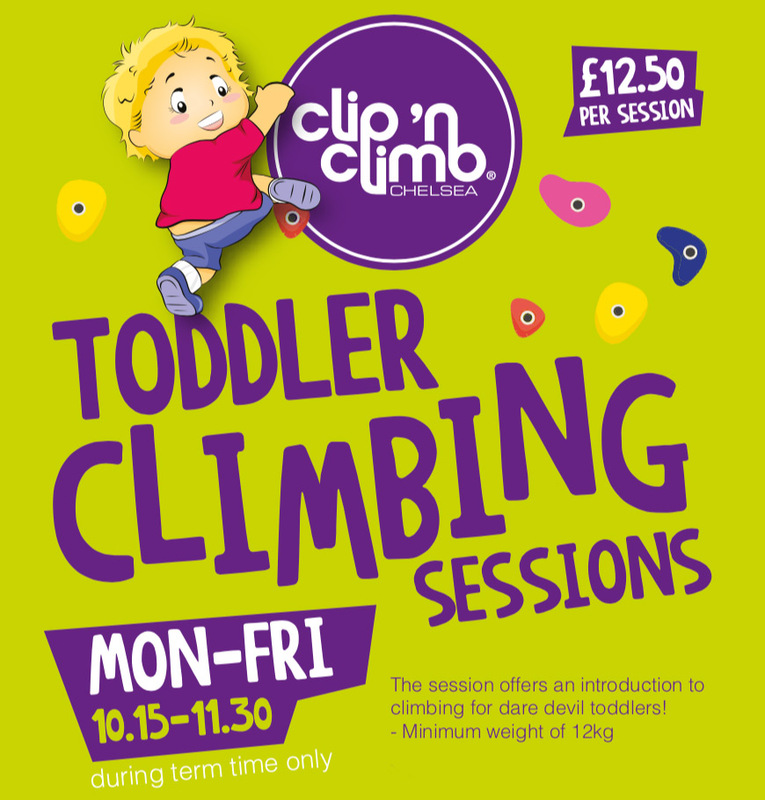 Increase your strength, balance and coordination as Clip 'n Climb's Personal Trainer’s put you through your paces! Working out shouldn’t have to be boring! Climbercise classes run on Mondays and Tuesdays at 7pm. Our Adult Only Climbing sessions are getting bigger and better! Join us after work in the 6pm, 7pm and 8pm sessions Monday-Friday or at 7pm on Saturdays for fun with your friends or a great way to keep on top of your fitness. These sessions a dedicated to adults only to ensure you get a chance for some fun too! This new high energy class will work you hard as you build your stamina and agility, covering boxing basics and striking combos designed to whip you into shape. Whether you’ve had a bad week at the office, looking to learn some of the basics, or just looking to get rid of some energy, Clip ‘n Climb Chelsea’s new Boxercise class will help you de-stress and balance. This HIIT style workout, combining boxing drills, combos, pad work & core exercises, is designed to give you a great all-over workout in a fun, safe, non-competitive environment. Men and women of all ages and fitness levels are welcome, with no previous boxing experience needed. This safe environment ensures that no class will involve the physical contact of sparring. Centred around group & pair work, each session will be different but will comprise of an active warm up, some basic technique drills, a circuit-based workout, and a cool down to finish. This also includes the use of the climbing walls in the main arena. Simply wear comfortable gym gear to the session and bring along a drink of water. Boxing gloves will be provided, however do feel free to wear some of your own. Boxercise will take place between 7pm-8.30pm every Thursday. Clip ‘n Climb Chelsea is a unique venue to hire for special celebrations such as 18th, 21st or 40th birthday parties (there’s no age limit by the way!). Do you want to host a party with a difference? Are you looking for somewhere to start your hen/stag party experience? As well as hiring the 3,500 ft2 climbing arena, we have a variety of different spaces available for socialising including the balcony area overlooking the arena and our light and airy Gallery Café. We offer fantastic menus for private parties, including BBQs in the summertime outside in the courtyard area. Contact our Events Manager, Jo Whittaker, at [email protected] to find out more about private hire at Clip ‘n Climb Chelsea. Social events can be cost-effective and high-impact when it comes to achieving corporate objectives such as investing in client / supplier relationships or rewarding employees. If you’d like to host something a little different for your next corporate networking event, team building day, product launch or Christmas party, then why not try Clip ‘n Climb Chelsea? Our friendly and experienced team pride themselves on attention to detail to ensure a truly memorable experience for your team or guests. The venue is conveniently located for anyone wanting to ‘escape the city’, and amongst the different spaces available we have a private room suitable for meetings and dining space suitable for sit down or buffet-style options. We create bespoke packages and have ideas to suit all budgets; accommodating events of any duration with or without exclusive use of the arena and facilities. We can tailor corporate events to include customised team building activities. For larger group numbers, or to offer a choice of activities, you can hire our indoor ski centre Chel-Ski next door for a joint climb/ski event! Please contact our Events Manager, Jo Whittaker, at [email protected] to find out more about hosting corporate events at Clip ‘n Climb Chelsea. How to find us! Visit the Chel-Ski Website!